I had the privilege of designing the Quilter's Planner Sampler for 2018 and I am happy to be sewing along with the quilt along! The sampler contains instructions for 12 different blocks and 2 different settings, an on-point setting and a traditional setting. 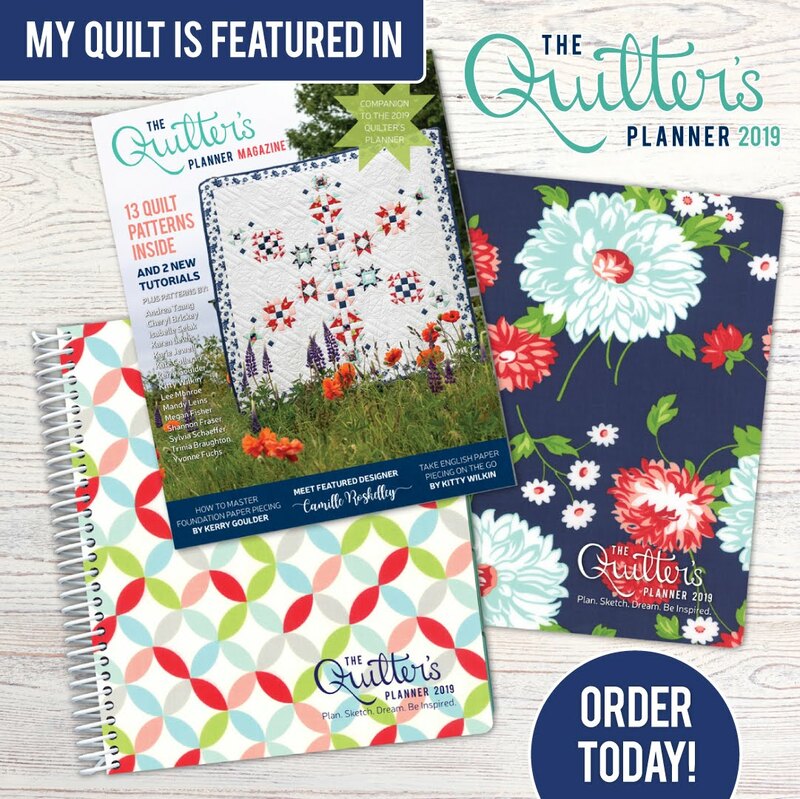 All of the instructions can be found in the pattern magazine that is included with a Quilter's Planner and is now also available in the Quilter's Planner Magazine (affiliate link) which contains the sampler and 13 additional patterns for only $12! 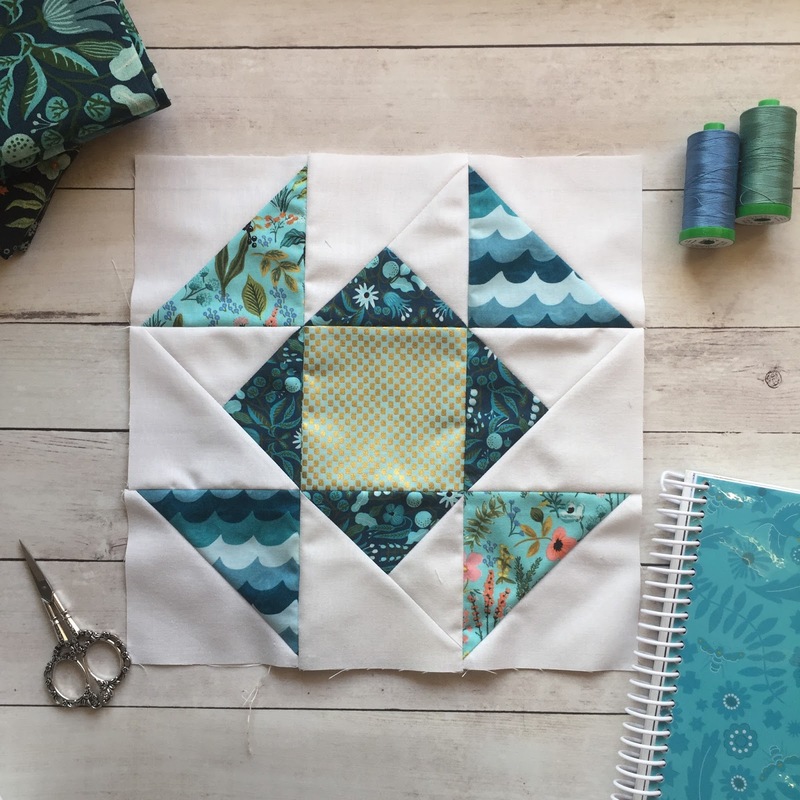 The quilt along is structured for one block each month (if you are making the on-point design you will have to make doubles of a few of your favorite designs to get to the 17 blocks in the quilt) with Facebook and Instagram link ups for prizes each month. Here are my blocks for January, February, and March.. 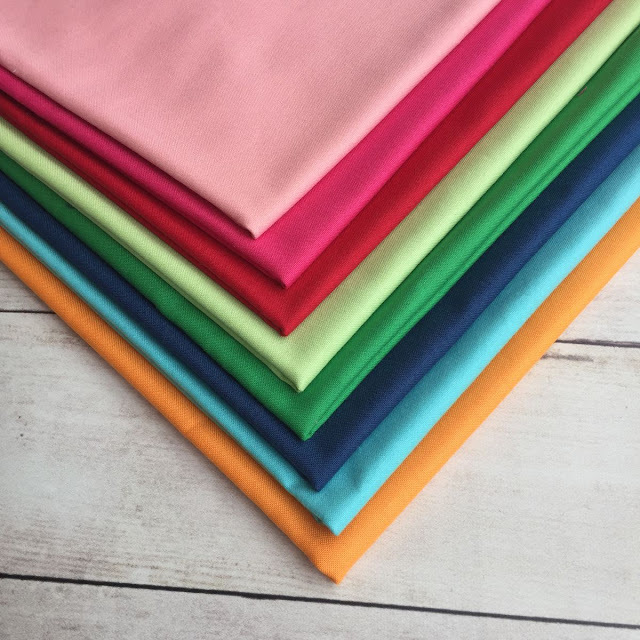 I have decided to use the Amalfi collection by Rifle & Co. for Cotton & Steel, using mostly the blue and green prints, which Cotton & Steel generously provided me. Remember, you can pick up the magazine with the sampler and 13 patterns right here. Have you decided to join in? What colors are you using? 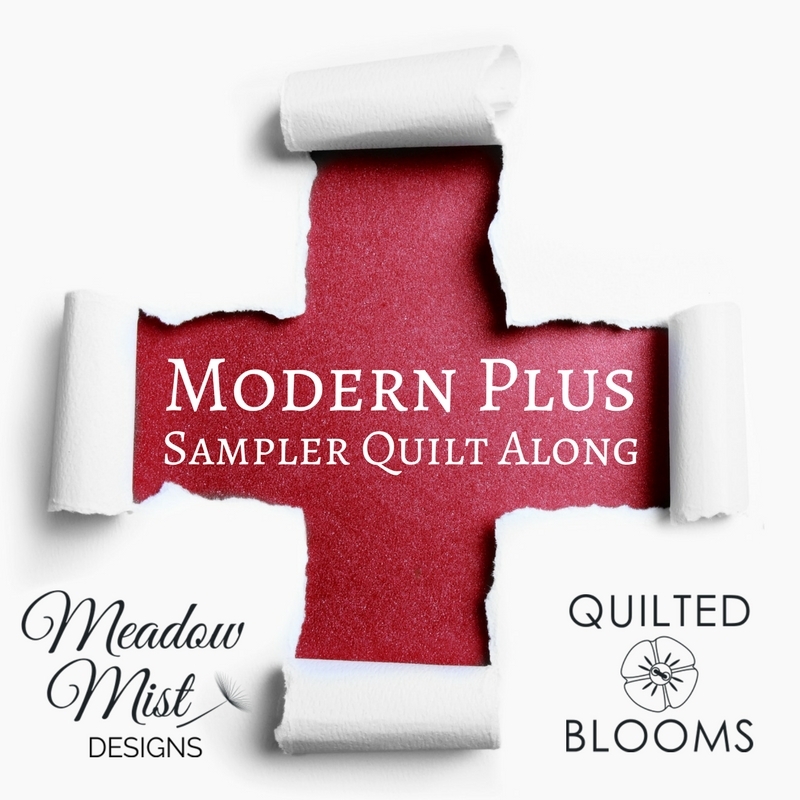 Today is the final day of Paige and my Modern Plus Sign Quilts book hop! 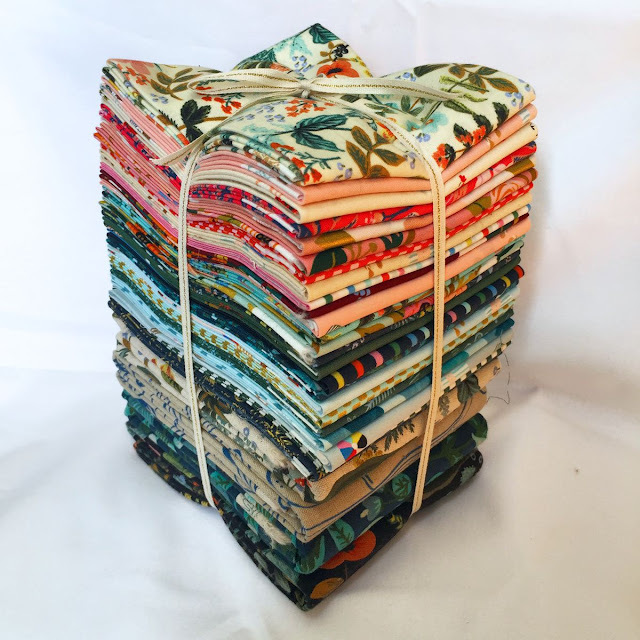 We want to thank all of the bloggers who took part in the hop, taking their time and fabric to make such beautiful versions of the patterns. We would also like to thank you for following along with the hop and for visiting all of the bloggers' blogs. 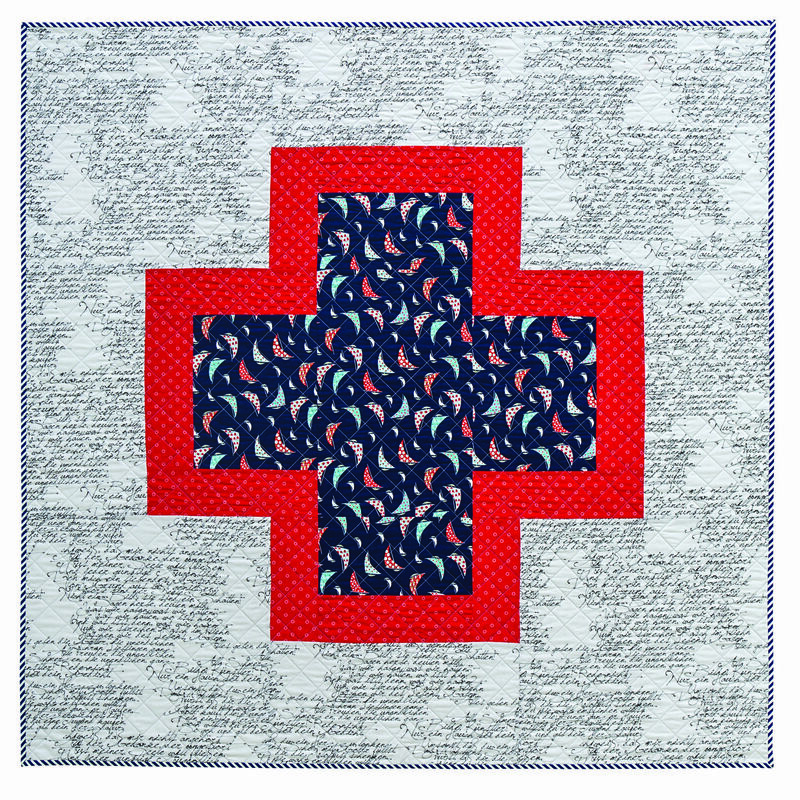 All of the quilters from across the U.S. and UK who contributed a Plus block for our signature quilt. 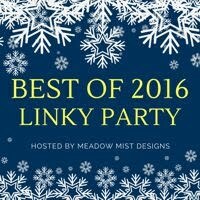 Let's end the hop with one last giveaway! 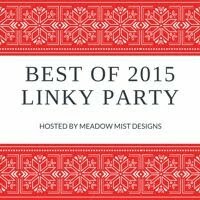 For the giveaway today, Make Modern is generously donating a 6-month subscription to Make Modern Magazine. Giveaway runs from March 23rd through 8 pm EST March 30th and is open worldwide. Note: this giveaway is the same on both my and Paige's page and so there is no need to enter on both blogs. Welcome to the ninth day of the Modern Plus Sign Quilts book hop! 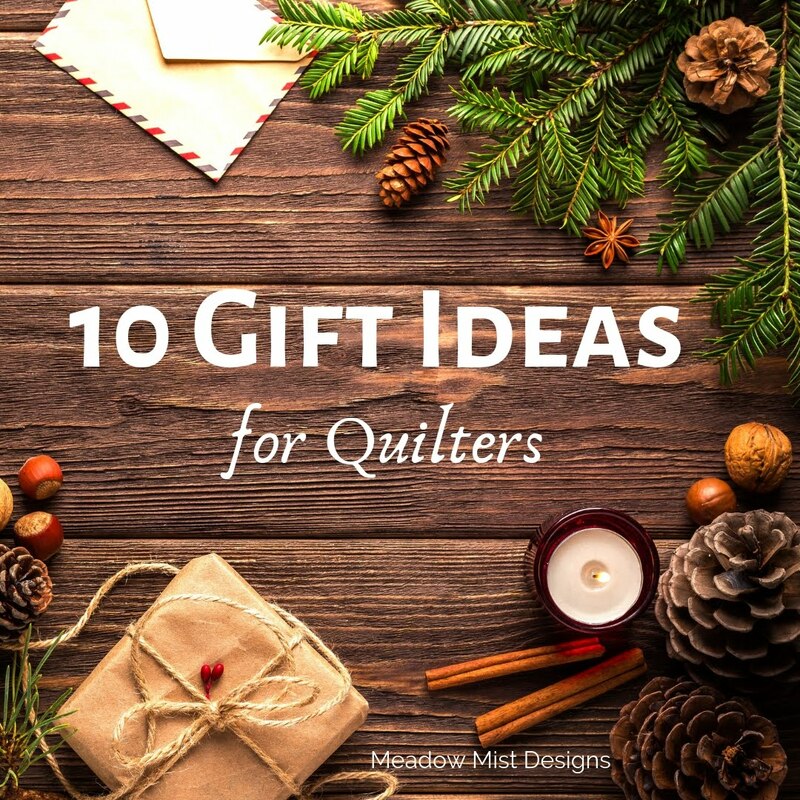 Today, we will be sharing the last two quilts, Intertwined and Bear Claw Plus as hosting a giveaway of a thread collection generously donated by Aurifil. 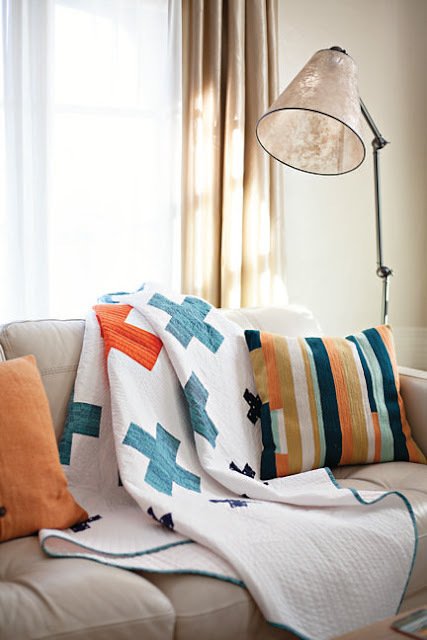 Paige and I wanted this quilt to be for a boy and when we saw Latifah Saafir's “Grafic” collection (the first screenprint collection of Me + You by Hoffman Fabrics) we knew that was the right collection for the quilt. I was originally supposed to make this quilt but when the fabric arrived at Paige's house, she called me up to let me know that the prints were too fabulous and that she was going to make it :) I got half of the leftover fabrics so I was still very happy. 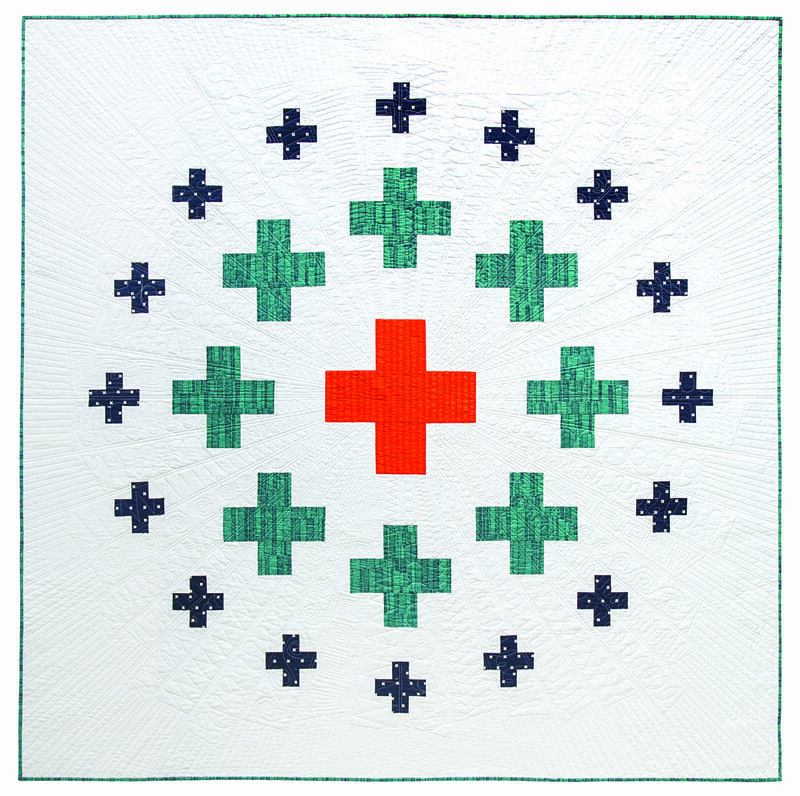 The batting was Warm & White, and Aurifil threads were used for the piecing and quilting. Bear Claw Plus is a lap sized quilt and one of the more time consuming designs (due to all of the half square triangles and seams to match). This is another of the team effort quilts with me designing it, Paige piecing it, and Johellen George doing the fabulous quilting. 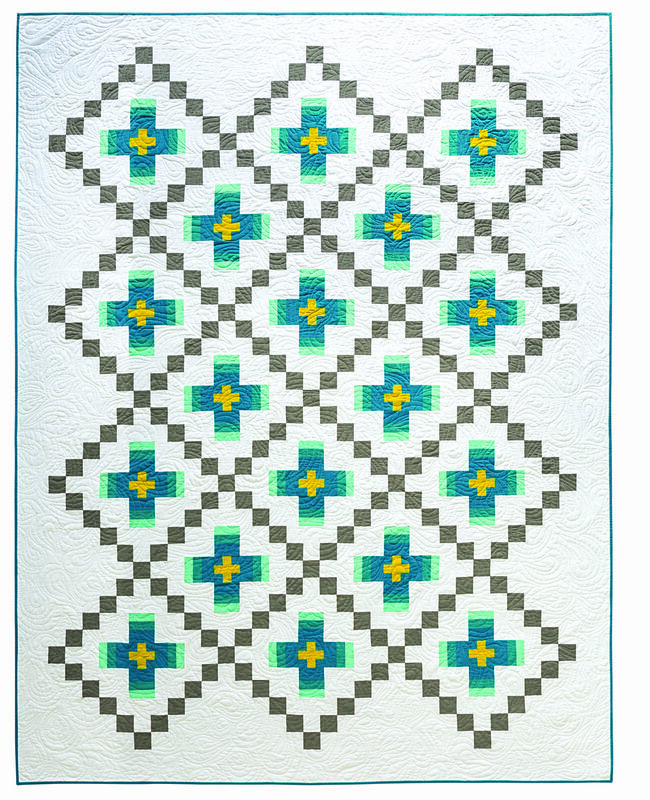 I love the Bear Claw Plus design and how the secondary patterns emerge when the blocks are put together. 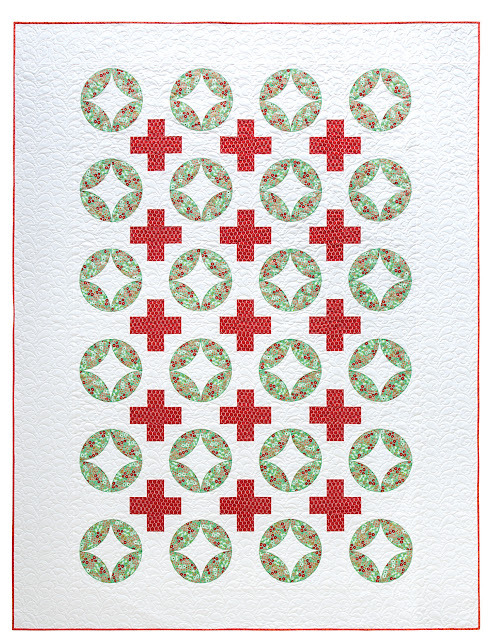 The fabrics came from Robert Kaufman, the batting was Warm & White, and Aurifil threads were used for the piecing. Today's giveaway is for a 10 piece small spool collection of Moonshine by Tula Pink for Aurifil. Many thanks to Aurifil for sponsoring this prize. To enter, simply use the rafflecopter: (if you are reading this post via e-mail, you may need to click over to the blog for the rafflecopter box to appear below). Giveaway runs from March 22nd through 8 pm EST March 29th and is open worldwide. The rafflecopter giveaway is the same on my and Paige's blog, so there is no need to enter on both blogs. 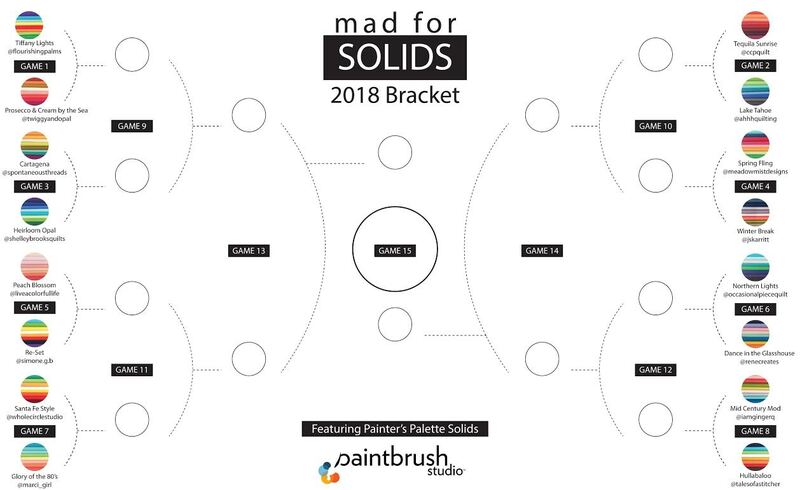 PB Studio Fabrics is sponsoring a fun game called Mad for Solids. 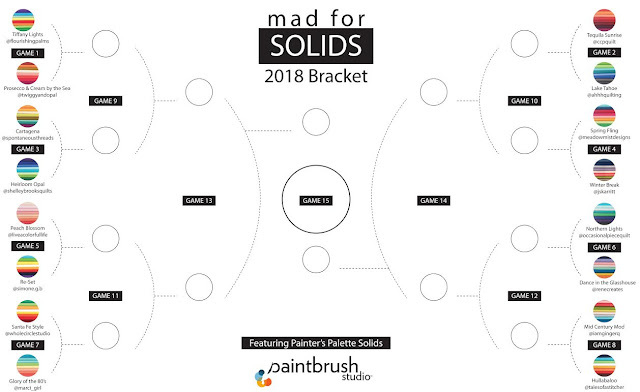 16 bloggers (including myself) selected a palette of 8 colors from Inspired by Fabric's Painter's Palette Solids and then the bundles complete head to head with other bundles for the most votes until one of the bundles is named the winner. I had such fun going through all of their solids and playing with different combinations. 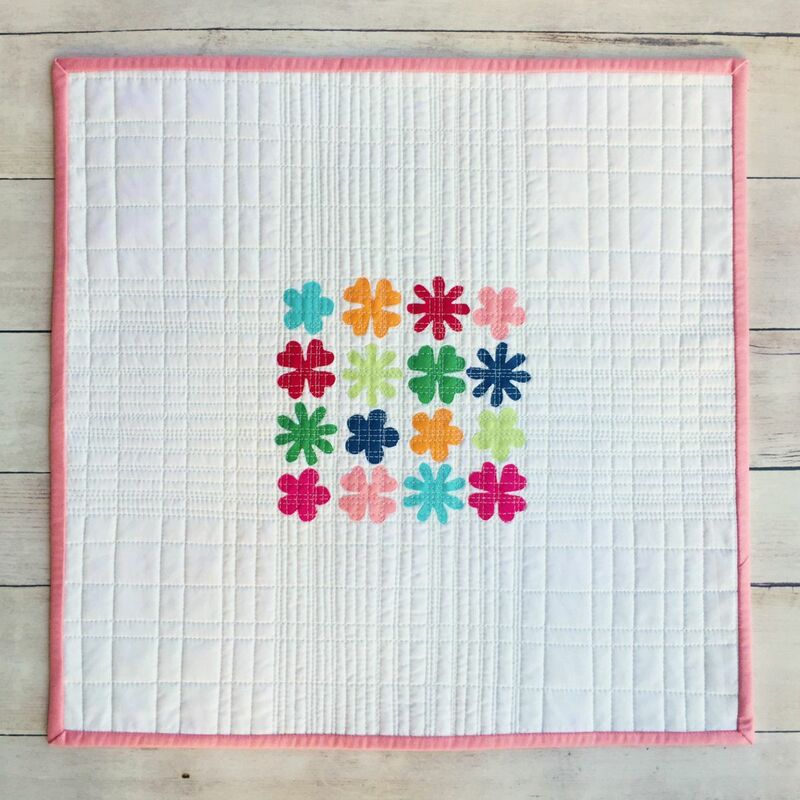 I have been doing a lot of paper piecing so I thought that making a fun spring mini would be a great little project to break up the paper piecing and use these great colors. I used my daughter's art book to trace out some different shaped flowers in each of the colors and centered them on some Painter's Palette Solid in white. 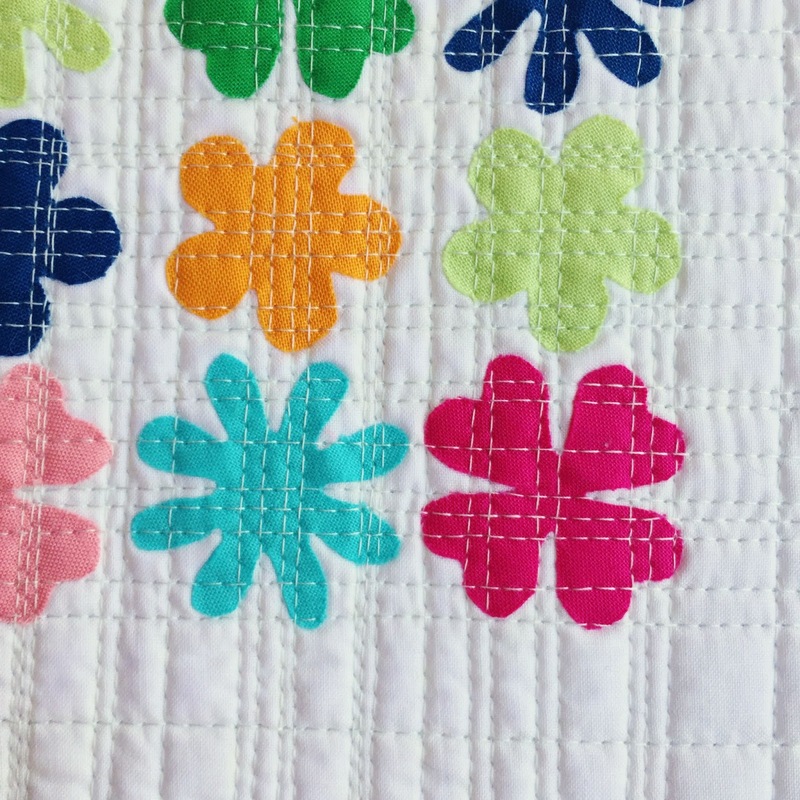 Then I added dense quilting over the flowers in both directions with some wider spaced quilting in the border areas. 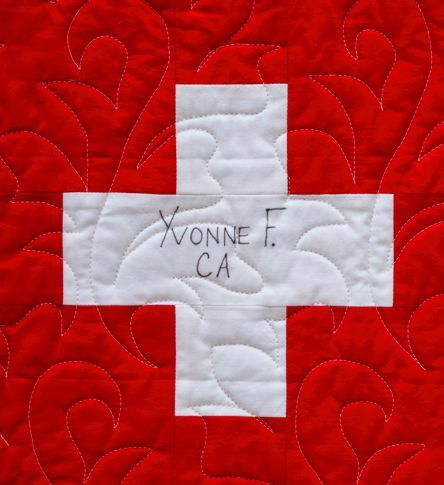 I have decided to gift the mini quilt to my coworker who's husband is battling leukemia right now. She deserves something bright and happy right now. My bundle Spring Fling is up against the beautiful bundle called Winter Break by Jacqueline Skarritt. 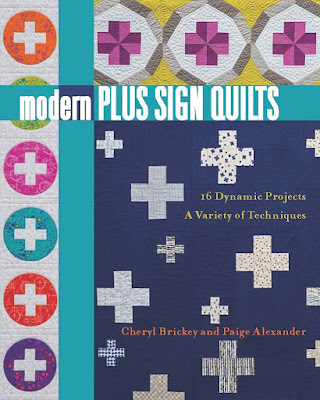 Welcome to the eighth day of the Modern Plus Sign Quilts book hop! Today, we will be sharing Celestial and Pinwheel Plus as well as hosting a giveaway of two charm packs. 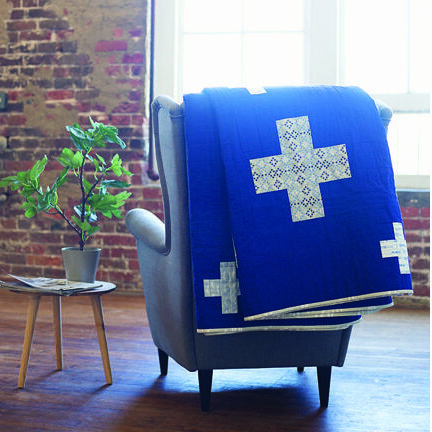 Celestial is the biggest quilt in the book, finishing at a queen size. 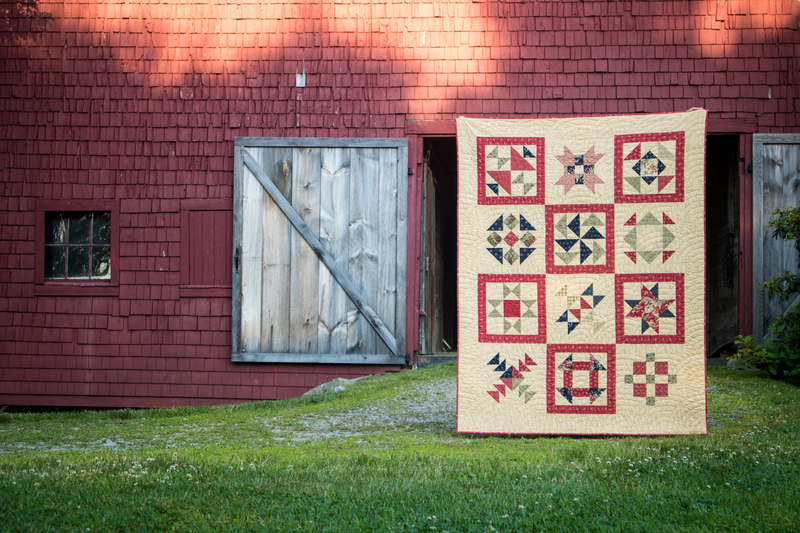 The quilt uses large 24" blocks though, so only 16 blocks are needed for the whole quilt! 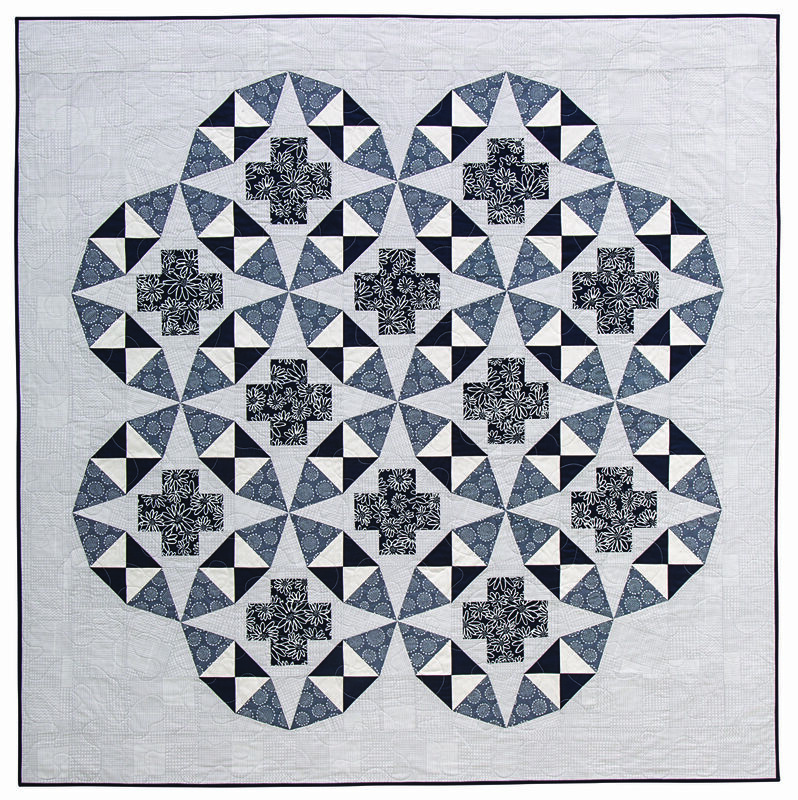 Celestial was hung in the C&T booth at QuiltCon and when it gets back I plan on using this quilt for my bed :) Johellen George worked her quilting magic on Celestial creating a large meandering square design. 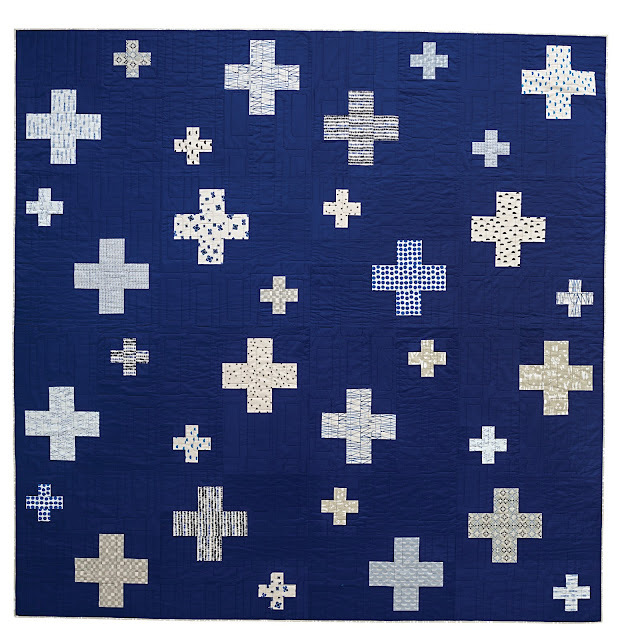 The fabrics used for this version were various Cotton & Steel prints on a background of Cotton Supreme fabric in indigo (a great dark blue), all from RJR Fabrics. The batting used was Warm & White and Aurifil threads were used for the piecing. 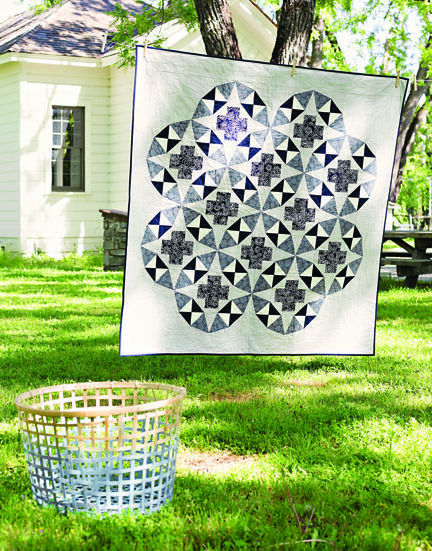 I designed Pinwheel Plus to be a marriage between plus signs and pinwheels. 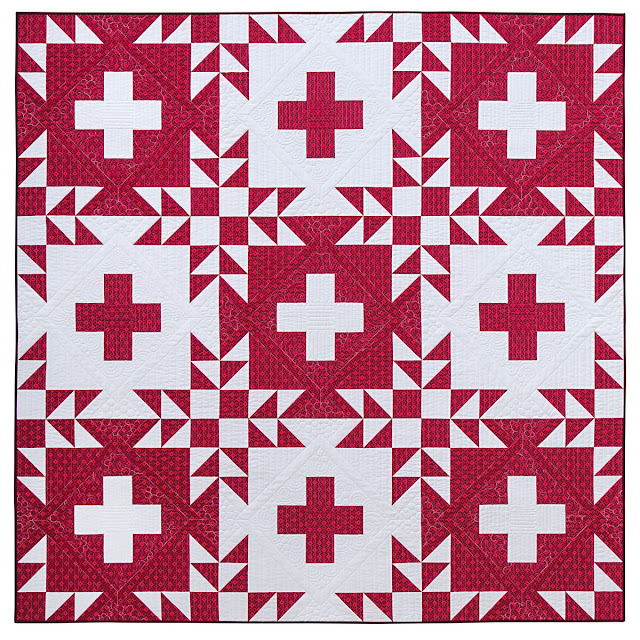 I love how in this design the plus signs are nested with the pinwheels so it is difficult to see how the quilt top is pieced together, can you figure it out? 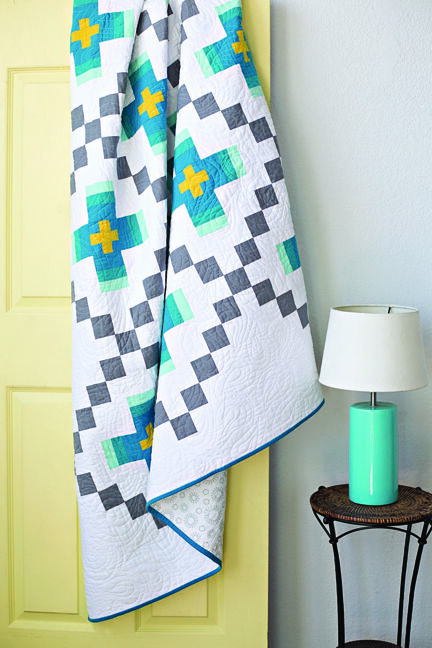 There are a lot of points to match (and half square triangles to make) in this quilt so Paige and I ranked this quilt as one of the more time consuming to make. Even before I had finished piecing the top, I knew that I wanted a the whimsical double loop design that Johellen had quilted on quilt for me in the past so she quilted the wonderful quilting on Pinwheel Plus. 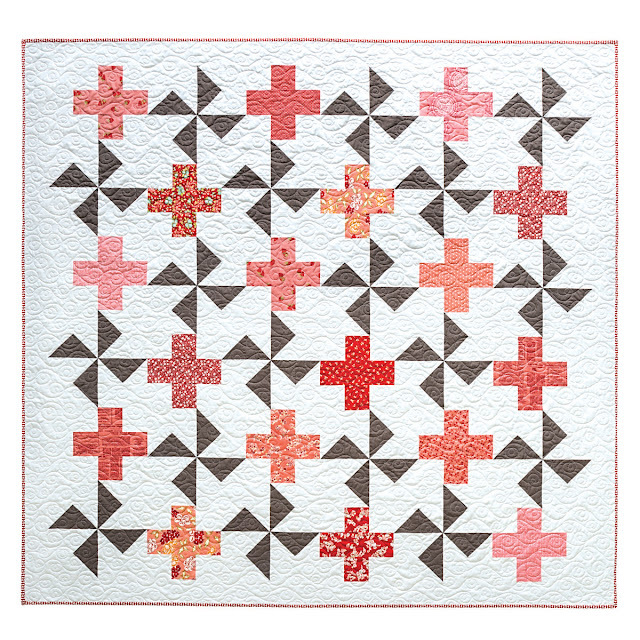 The fabrics in this quilt top are Michael Miller Cotton Couture solids in Coin and White (Coin is one of my favorite grays, it has an undertone of brown in it so it pairs so well with pinks) as well as various pink prints. The batting was Warm & White and Aurifil threads were used for the piecing. 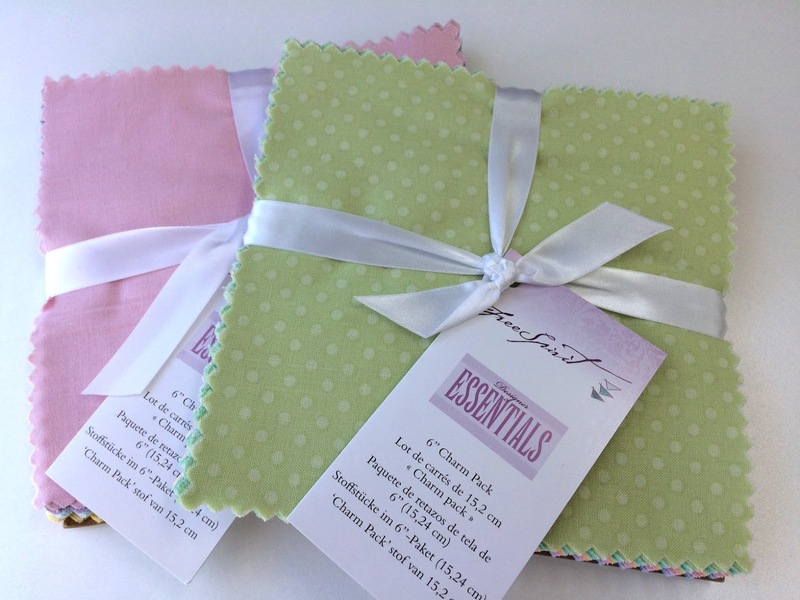 Today's giveaway is for two (2) charm packs of FreeSpirit Essentials. To enter, simply use the rafflecopter: (if you are reading this post via e-mail, you may need to click over to the blog for the rafflecopter box to appear below). Giveaway runs from March 21st through 8 pm EST March 28th and is open worldwide. Welcome to the seventh day of the Modern Plus Sign Quilts book hop! 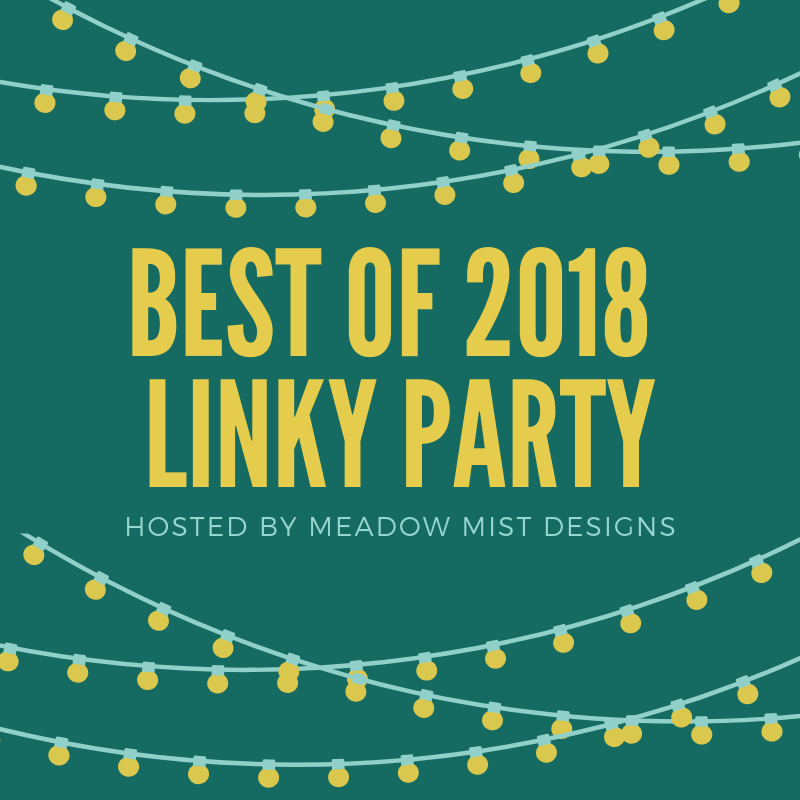 Today, we will be sharing Message in a Bottle and Cute as a Button as well as hosting a giveaway of a thread collection generously donated by Aurifil. 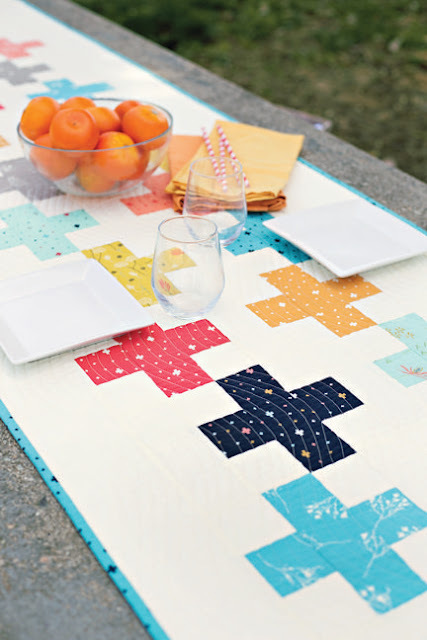 Message in a Bottle is a quick and easy baby quilt with a really bold look. 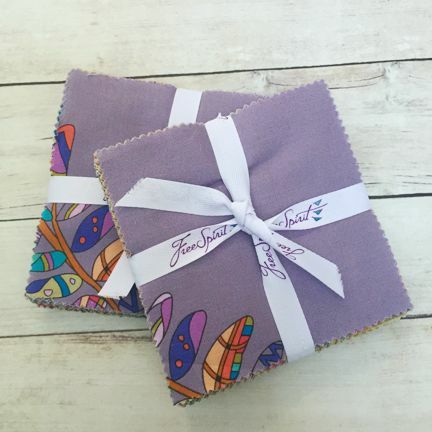 I had such fun picking out fabrics for this design, you can really use some focal or larger scale prints in this design because the fabric pieces are so large. 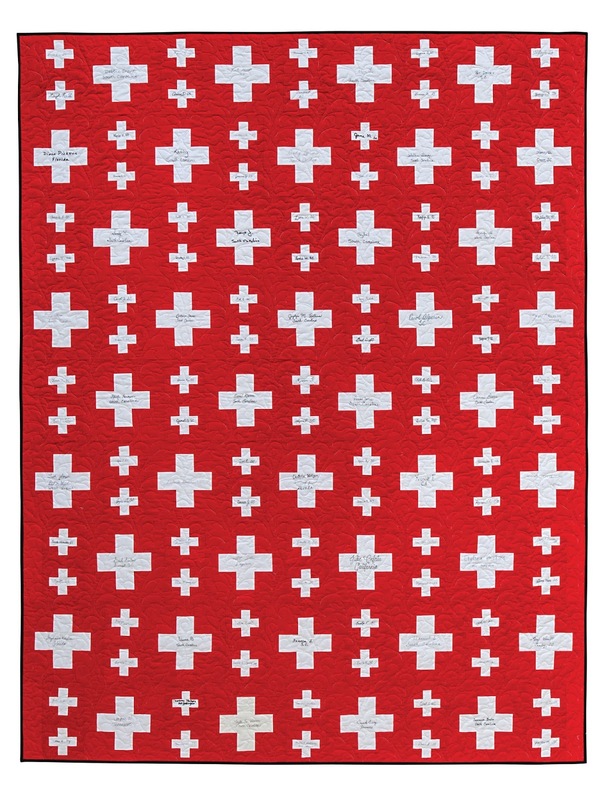 If you like this design and want a larger quilt, you could actually make four of the baby quilts, then piece them into one large queen/king size quilt. 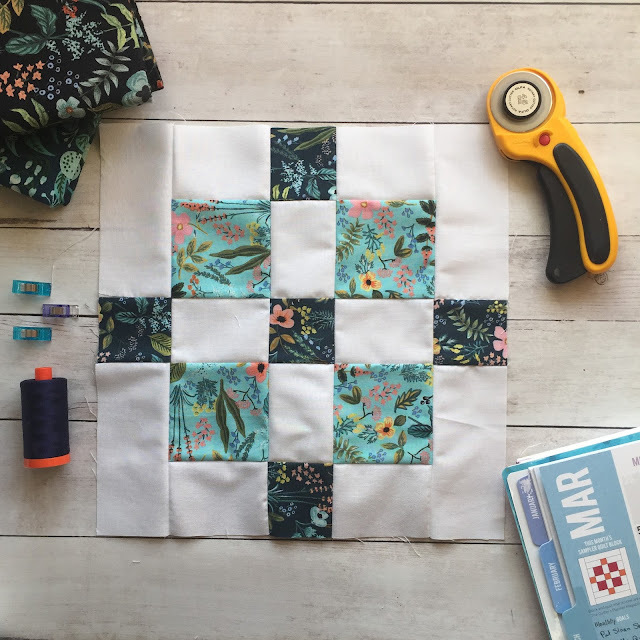 The fabrics were from Zen Chic and Bonnie and Camille for Moda, the batting was Warm & White, and Aurifil threads were used for the piecing and quilting. 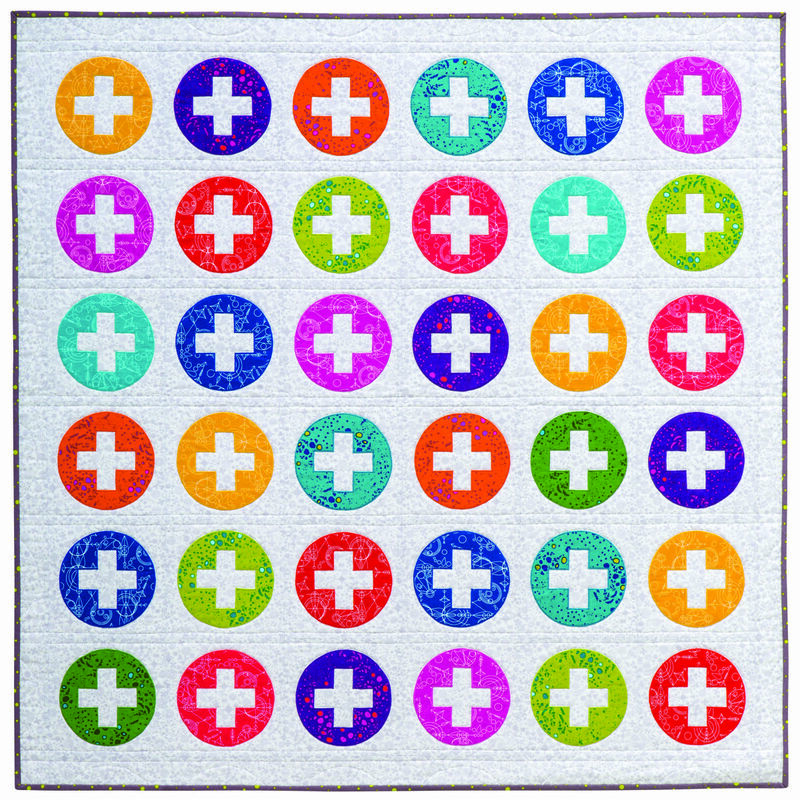 Cute as a Button is an applique pattern that was designed, sewn, and quilted by Paige. 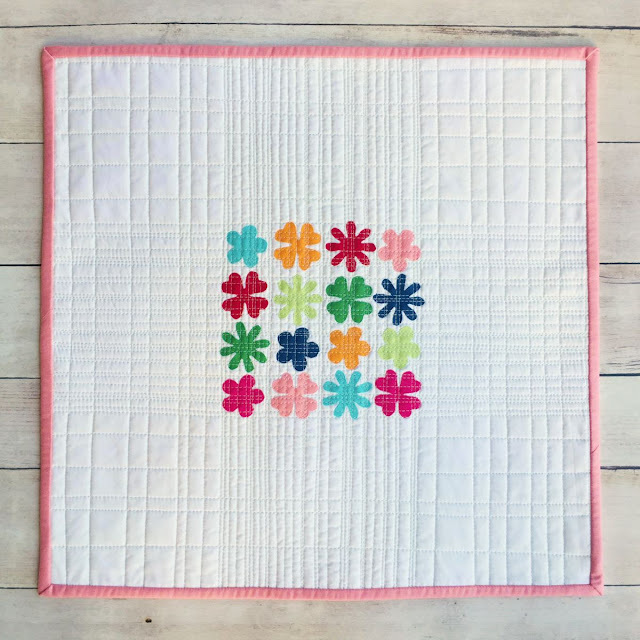 I love the adorable little plus sign buttons in this design and the colors are perfect for a baby quilt. 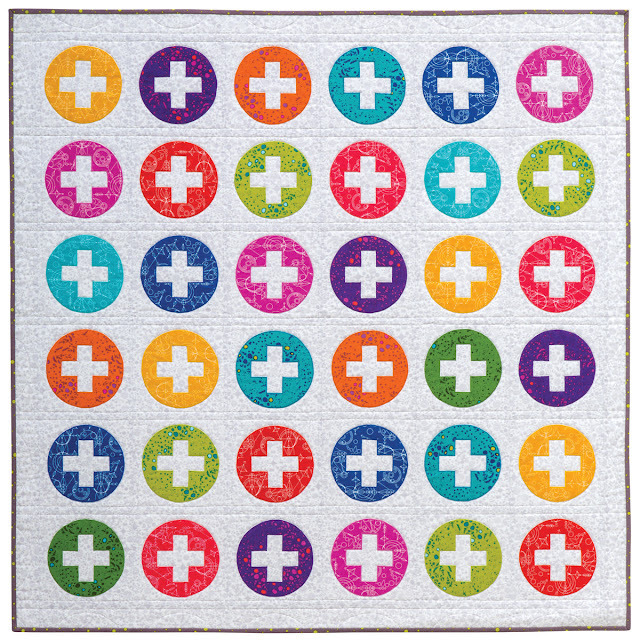 The fabrics in this version of Cute as a Button from the Sun Print 2015 and Sun Print 2016 collections by Alison Glass for Andover Fabrics, Inc., the batting was Warm & White, and Aurifil threads were used for the piecing and quilting. 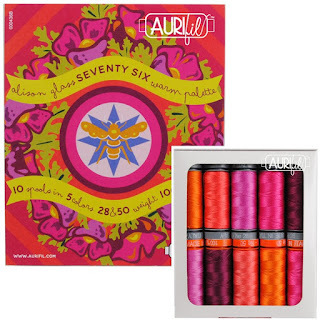 Today's giveaway is for a 10 piece small spool collection of Seventy Six by Alison Glass for Aurifil. 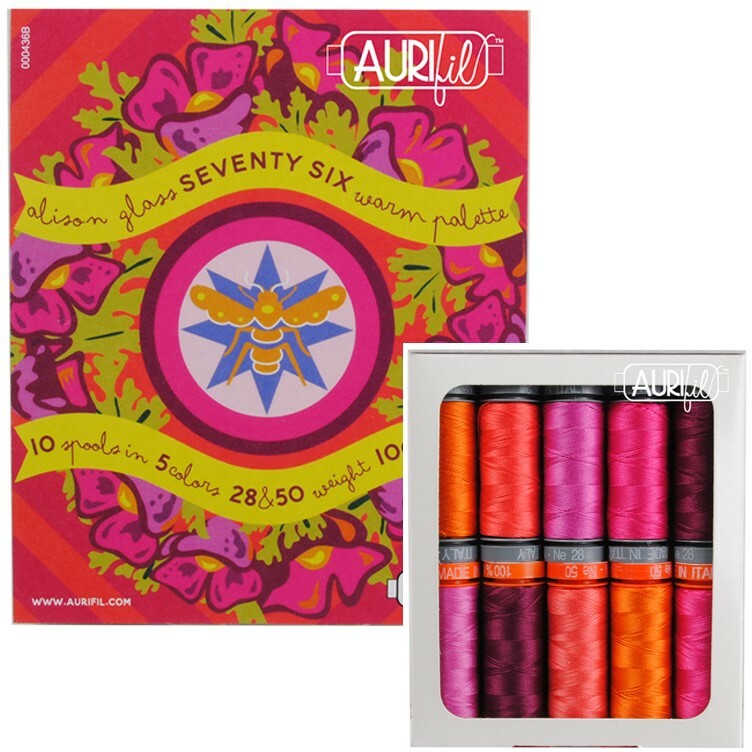 Many thanks to Aurifil for sponsoring this prize. To enter, simply use the rafflecopter: (if you are reading this post via e-mail, you may need to click over to the blog for the rafflecopter box to appear below). Giveaway runs from March 20th through 8 pm EST March 27th and is open worldwide. 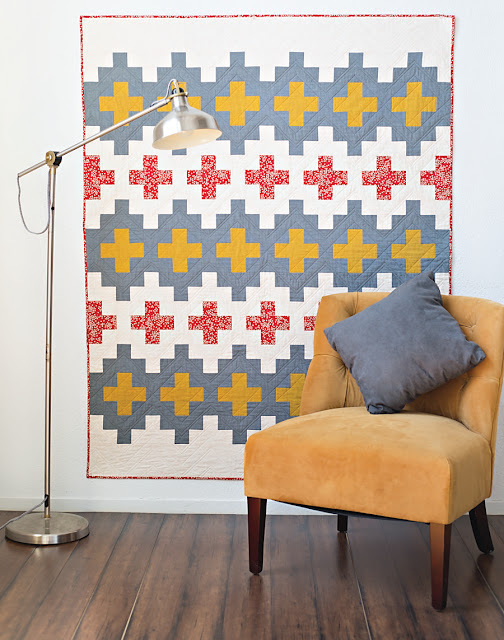 Welcome to the sixth day of the Modern Plus Sign Quilts book hop! Today, we will be sharing Faceted Rings and Petal Plus as well as hosting a giveaway of two charm packs. 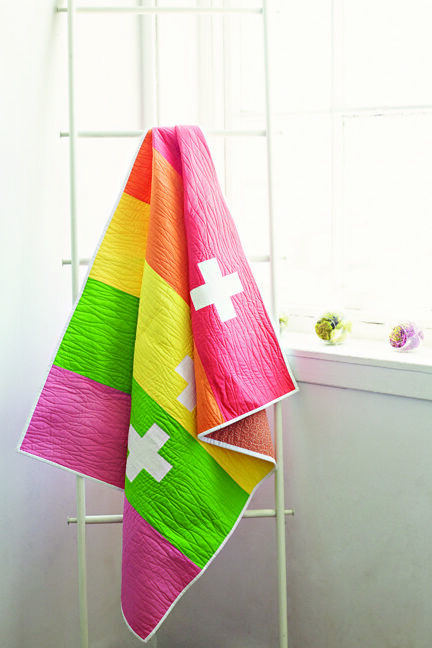 Faceted Rings is one of my favorite quilts from the book so I am happy that it is on the cover of the book. 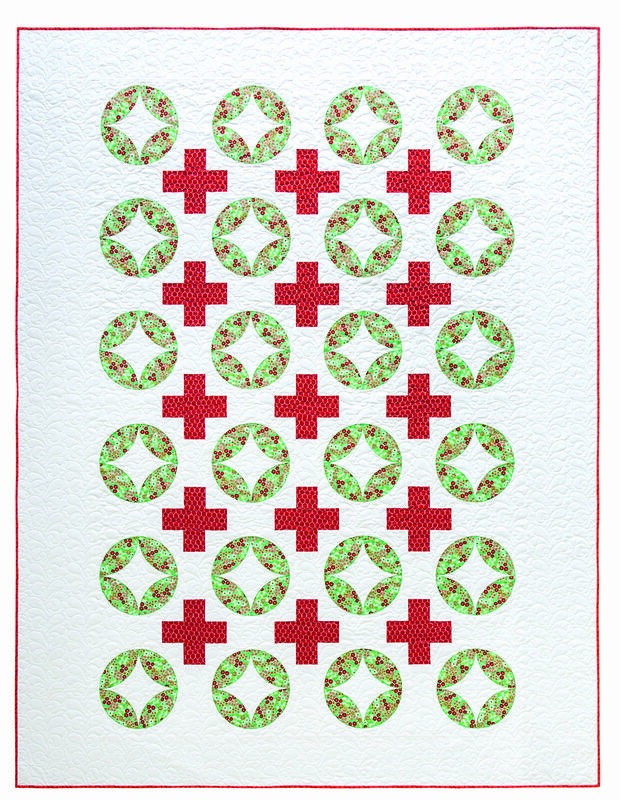 It is a paper pieced baby sized design and one of the more time consuming and challenging patterns in the book. 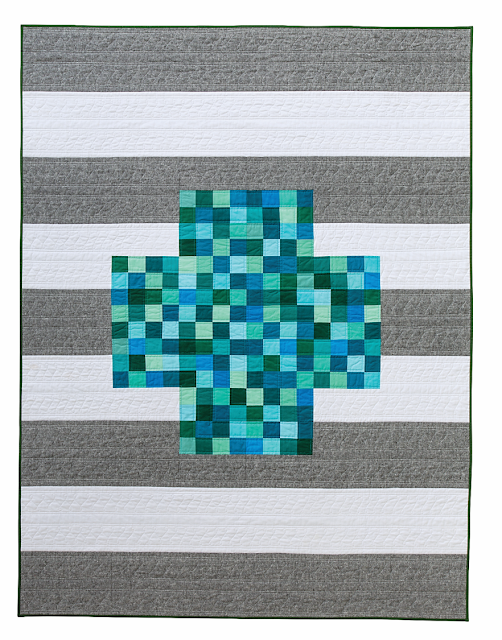 Because it is a baby quilt, only 9 blocks are needed (which does make the quilt comes together more quickly). 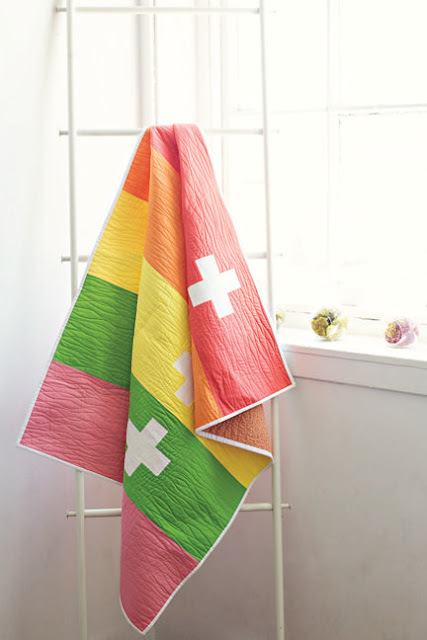 I took a while to figure out how to quilt this quilt. 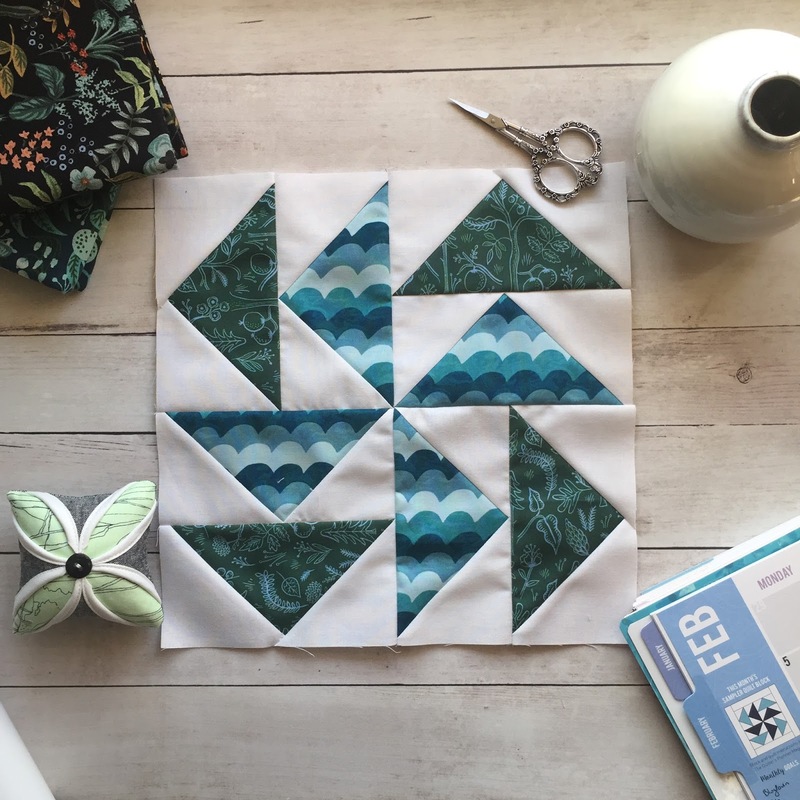 I initially was thinking about an allover pattern, but I really felt that I wanted to add special texture to each section to really highlight the piecing of the design. 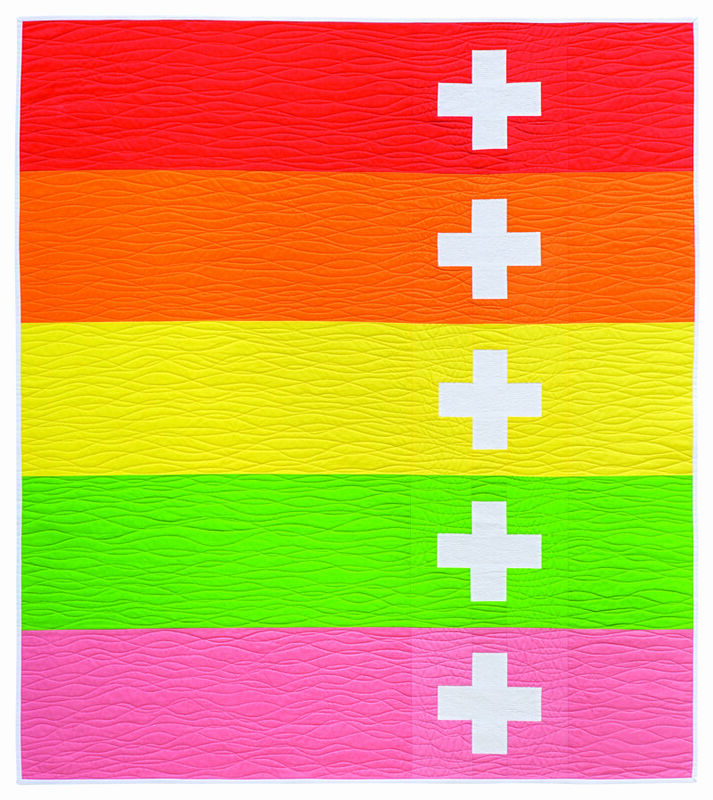 I settled on quilting each Kona color of the quilt differently (with matching Aurifil thread for each section). 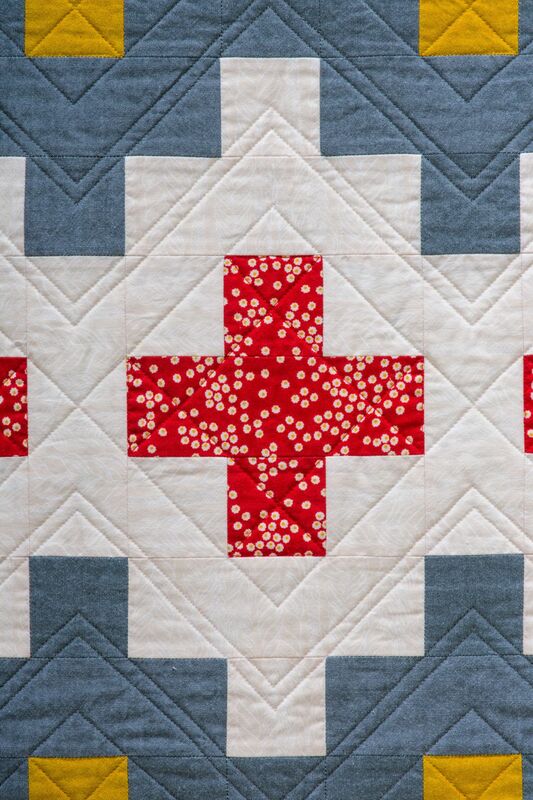 The quilt was made using Kona Cotton Solids from Robert Kaufman, the batting was Warm & White, and Aurifil threads were used for the piecing and quilting. The fabrics were Farm Fun by Stacy Iest Hsu and Bella Solids all by Moda Fabrics, the batting was Warm & White, and Aurifil threads were used for the piecing. Today's giveaway is for a 6-piece fat quarter bundle of American Made Brand solids. To enter, simply use the rafflecopter: (if you are reading this post via e-mail, you may need to click over to the blog for the rafflecopter box to appear below). Giveaway runs from March 19th through 8 pm EST March 26th and is open worldwide. 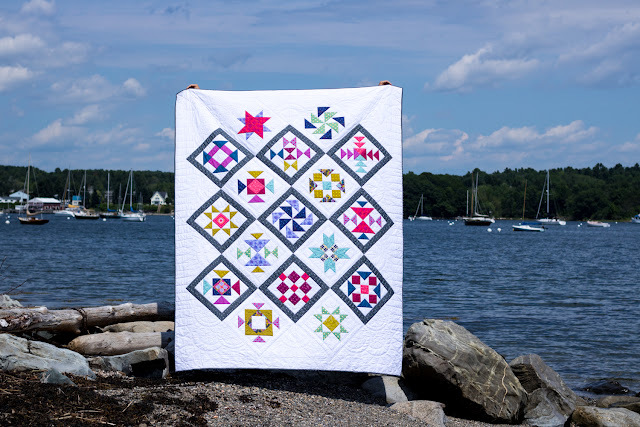 Welcome to the fifth day of the Modern Plus Sign Quilts book hop! Today, we will be sharing Row Addition and Transparency Chains as well as hosting a giveaway of two charm packs. 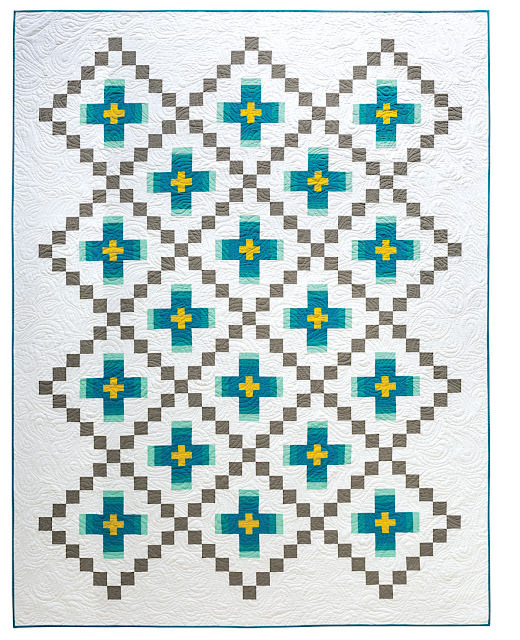 Row Addition was one of the first designs and Paige and I came up with when we were brainstorming quilt patterns for the book. 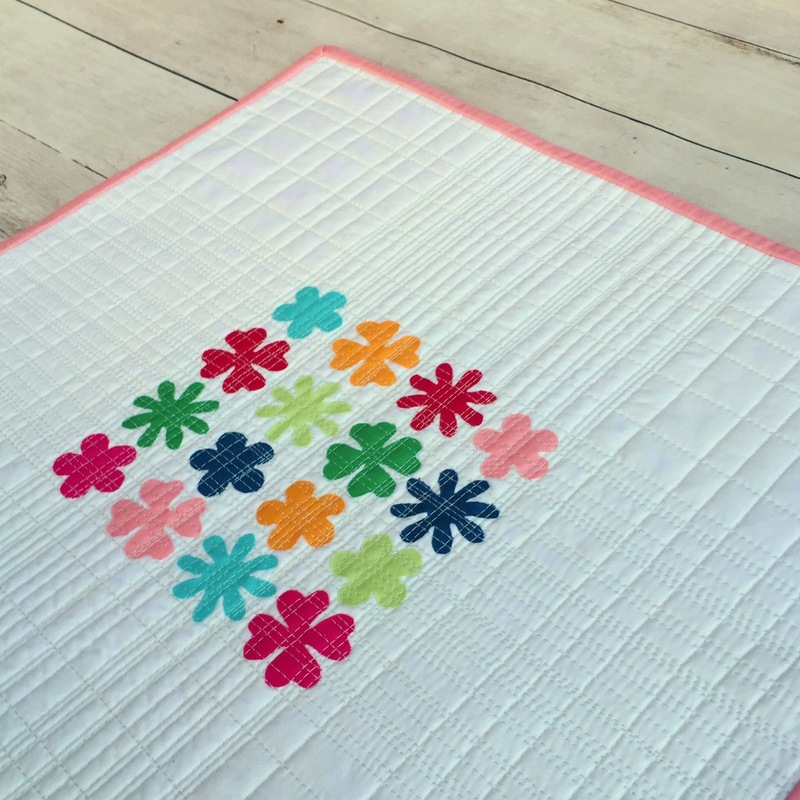 It is the prefect design for a quick baby quilt sized finish and the design can look so different using different prints and colors. The Cotton Supreme fabrics came from RJR Fabrics, the batting was Warm & White, and Aurifil threads were used for the piecing and quilting. 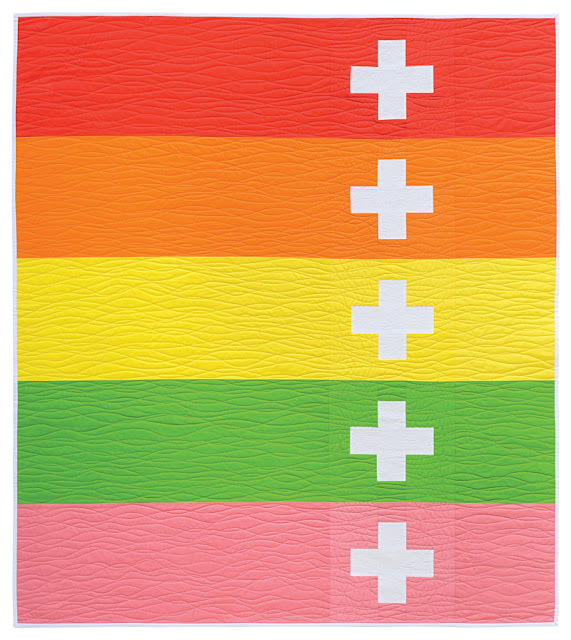 Transparency Chains came together as a marriage of the plus sign design and a traditional Irish Chain design. 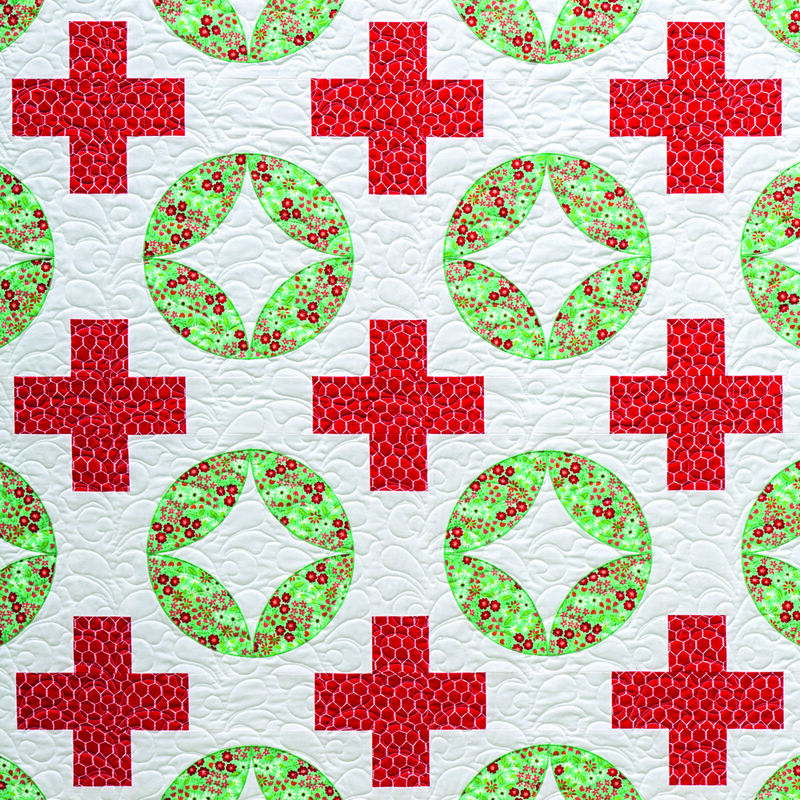 I quilted this quilt on the Bernina sit down longarm machine at my local Bernina shop, Bernina..We're in Stitches with a large allover paisley swirl design. 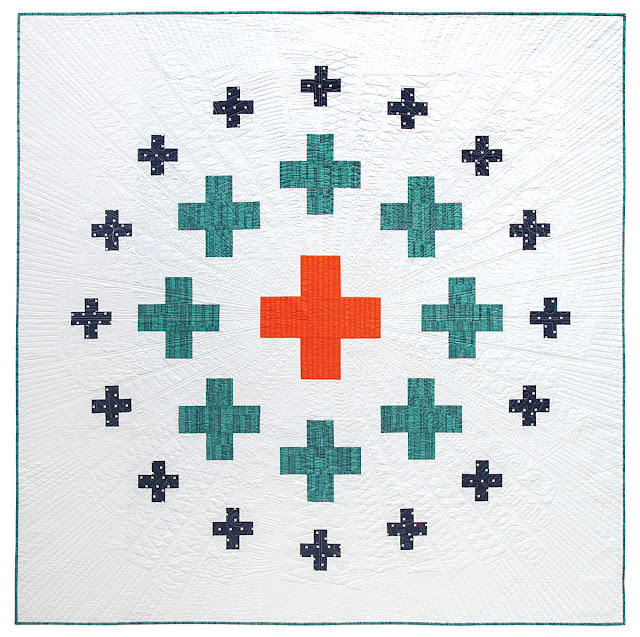 The fabrics came from Cloud 9 fabrics, the batting was Warm & White, and Aurifil threads were used for the piecing and quilting. 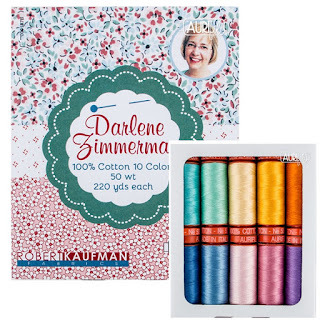 Today's giveaway is for two (2) charm packs of Folk Art Revolution by Kathy Doughty for FreeSpirit. To enter, simply use the rafflecopter: (if you are reading this post via e-mail, you may need to click over to the blog for the rafflecopter box to appear below). Giveaway runs from March 16th through 8 pm EST March 23rd and is open worldwide. Giveaway now over, congrats Jan A.! 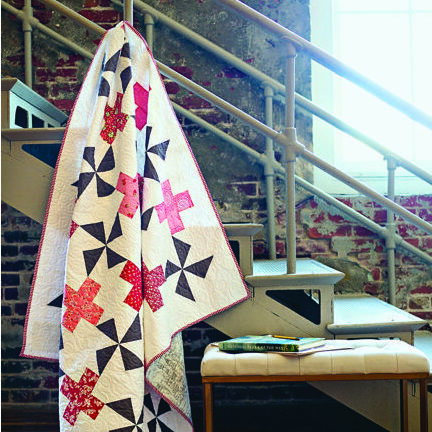 Welcome to the fourth day of the Modern Plus Sign Quilts book hop! 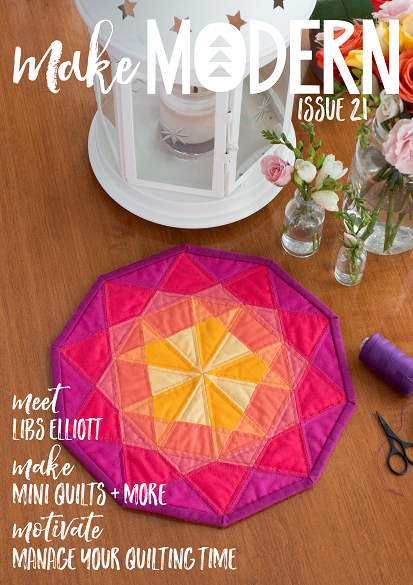 Today, we will be sharing Postage Plus and Rick Rack Runner as well as hosting a giveaway of some fabulous thread (sponsored by Aurifil). 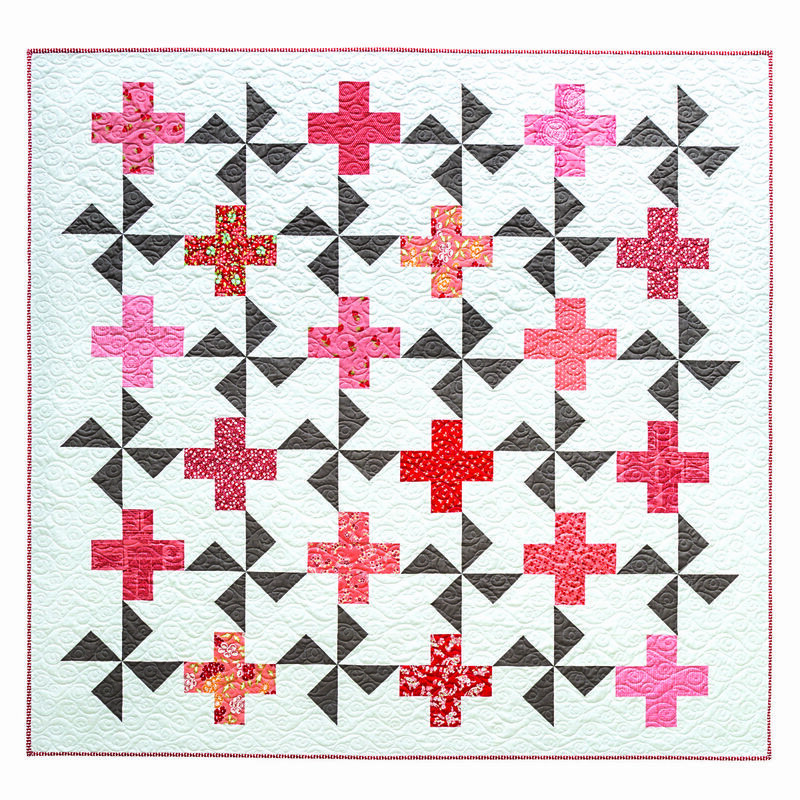 Postage Plus is a great pattern to use up some of your 2 1/2" x 2 1/2" squares (these squares can come from a precut or from your scraps). For this version of Postage Plus, I used Kona Cotton solid scraps in blues and greens and paired them with some Kona white and Essex Linen yard dyed in black stripes. Warm & White batting from the Warm Company and Aurifil thread were also used. 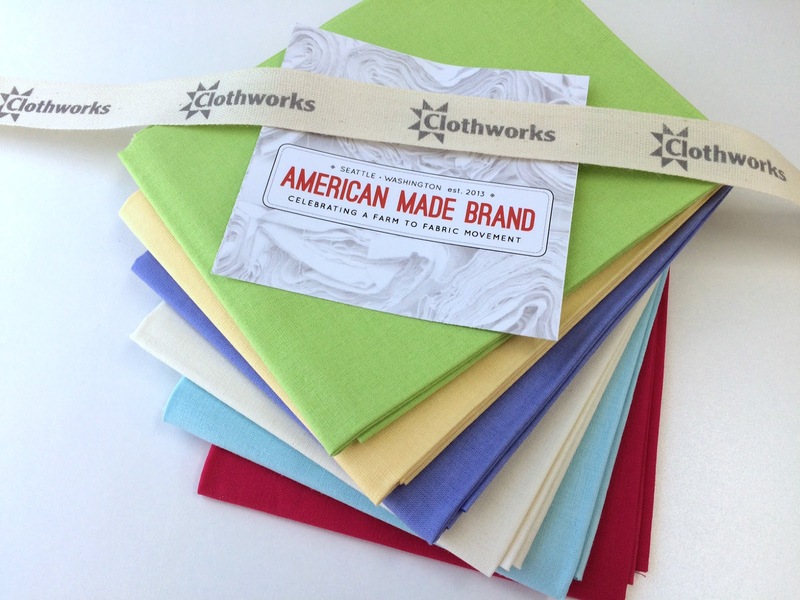 Do you have a layer cake in your stash? If yes, Rick Rack Runner is the perfect pattern for it. The runner is great for a dining room table or at the end of a bed and is easy sized up and down to fit your furniture. The fabrics came from Moda fabrics, the batting was Warm & White, and Aurifil threads were used for the piecing and quilting. 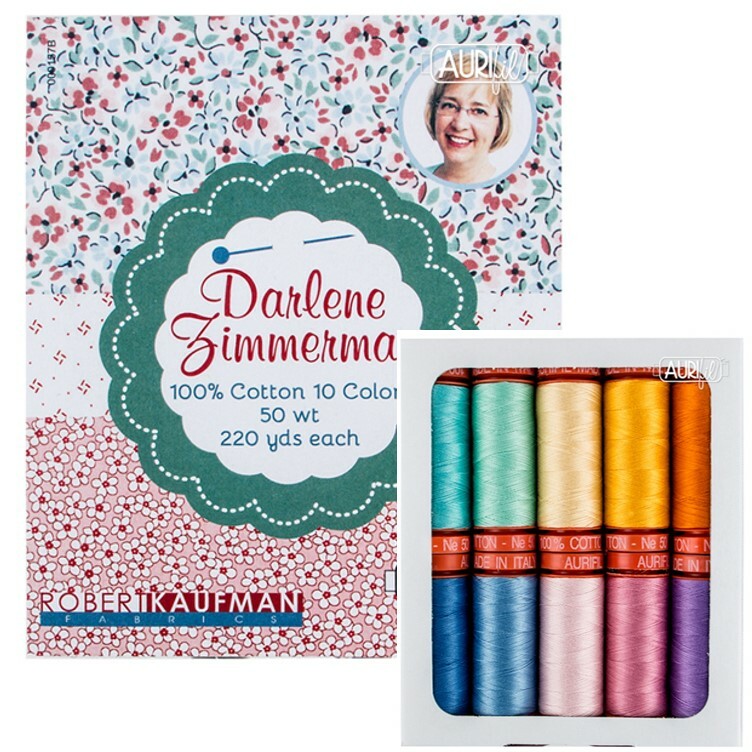 Today's giveaway is for an Aurifil 10 SMALL SPOOLS (50 wt) collection by Darlene Zimmerman, graciously donated by Aurifil (the thread will be shipped directly to the winner from Aurifil and collection may be swapped for another collection if necessary). To enter, simply use the rafflecopter: (if you are reading this post via e-mail, you may need to click over to the blog for the rafflecopter box to appear below). Giveaway runs from March 15th through 8 pm EST March 22nd and is open worldwide. Giveaway now closed, congrats to Liz H! 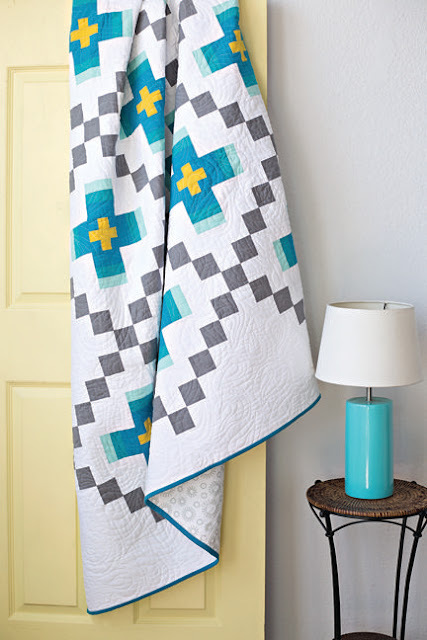 Welcome to the third day of the Modern Plus Sign Quilts book hop! 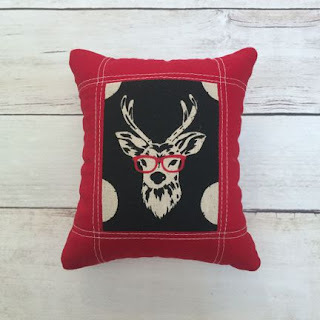 Today, we will be sharing Plus Surround and Kaleidoscope Plus as hosting a giveaway of a fun handmade pincushion. 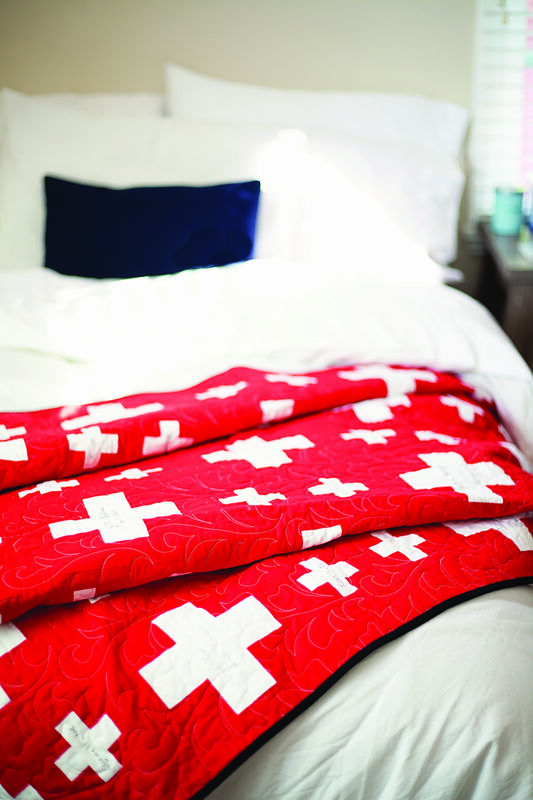 Plus Surround is lap sized design that Paige designed, pieced, and quilted with a bulls eye-like effect of plus signs. 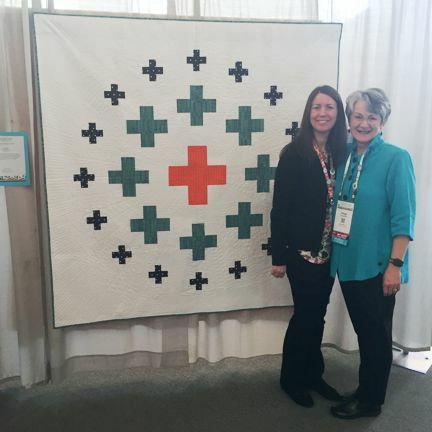 Plus Surround was juried into QuiltCon 2018 and hung in the modern traditional category. 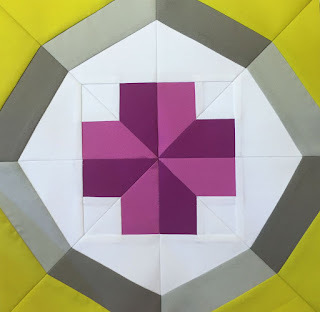 The fabrics came from Cotton & Steel and Robert Kaufman, the batting was Warm & White, and Aurifil threads were used for the piecing and quilting. 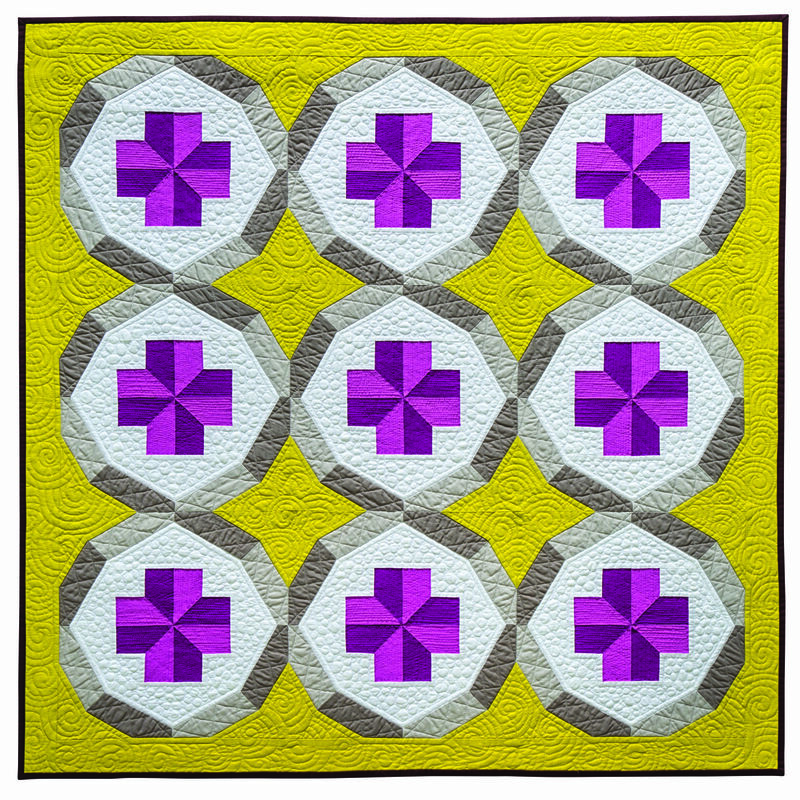 Kaleidoscope Plus is a paper pieced design that combines a traditional kaleidoscope design with plus signs for this interlocking circle pattern. 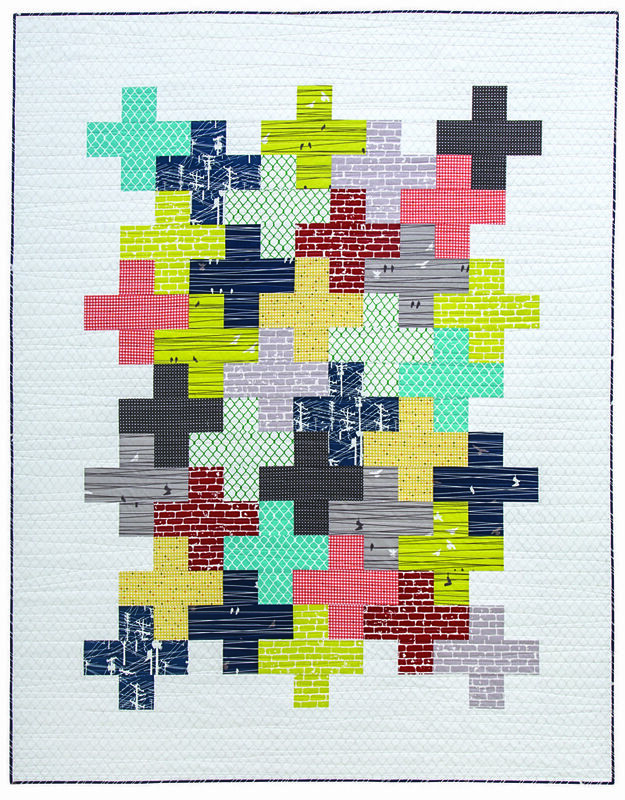 I love how paper piecing allows for different angles as compared to traditional piecing. The fabrics came from Robert Kaufman (mostly Blueberry Parks by Karen Lewis), the batting was Warm & White, and Aurifil threads were used for the piecing and quilting. 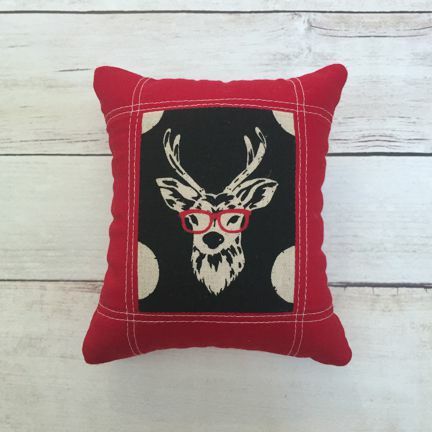 Today's giveaway is for a handmade pincushion (made by me) using some Echino Stag with Glasses fabric. It is a large and weighty pincushion measuring about 3 1/2" x 5" and filled with a mixed of crushed walnut shells and polyester stuffing. 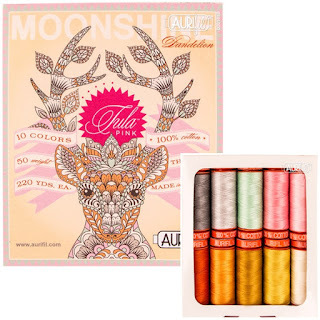 To enter, simply use the rafflecopter: (if you are reading this post via e-mail, you may need to click over to the blog for the rafflecopter box to appear below). Giveaway runs from March 14th through 8 pm EST March 21th and is open worldwide. The giveaway is now over, congrats to Toni B! 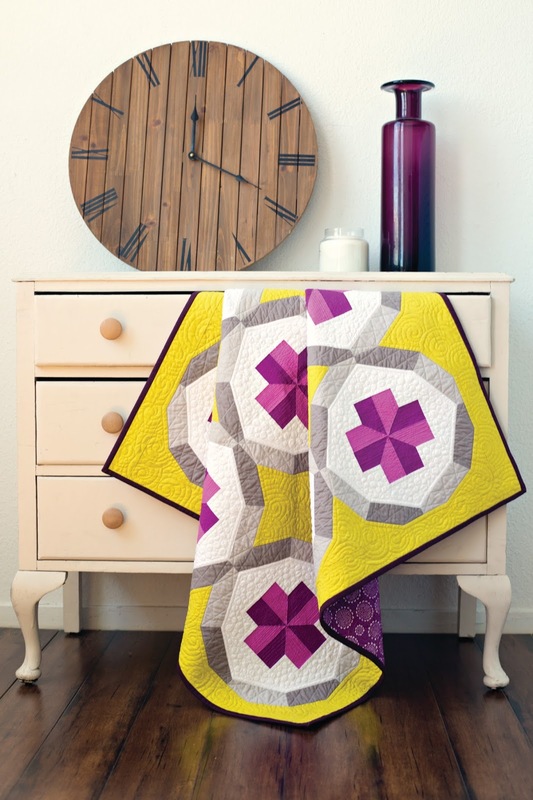 Welcome to the second day of the Modern Plus Sign Quilts book hop and the first day we are sharing book quilts! 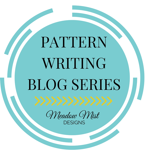 Today, we will be sharing Signature Plus and Tribal Plus as well as hosting a giveaway of some fabulous thread (sponsored by Aurifil). 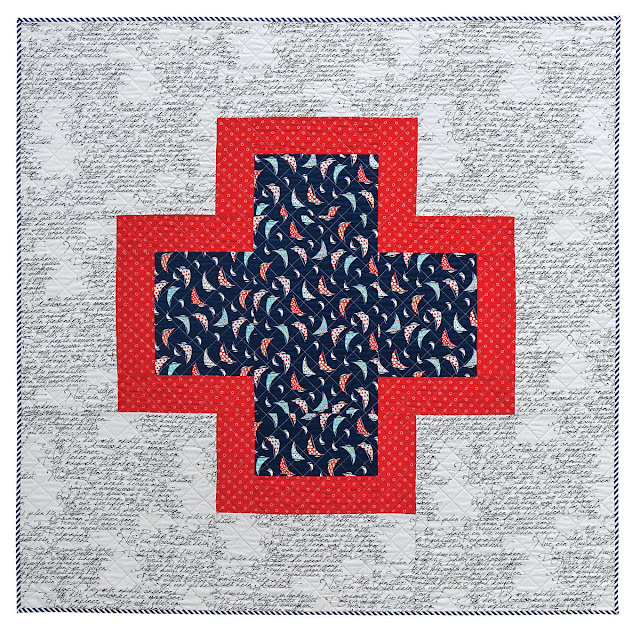 Signature Plus was our take on a modern version of the Red Cross Signature Quilt from WWI (you can see the WWI version and read more about it here). 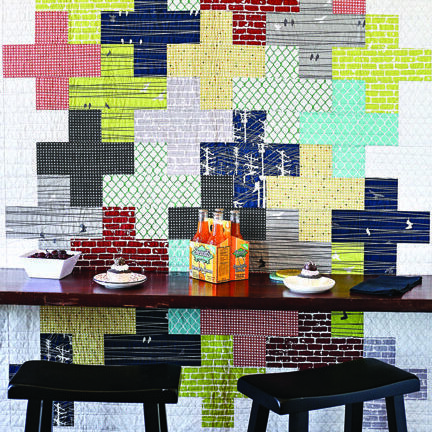 Our Signature Plus blocks were made by 122 bloggers from across the US and England. 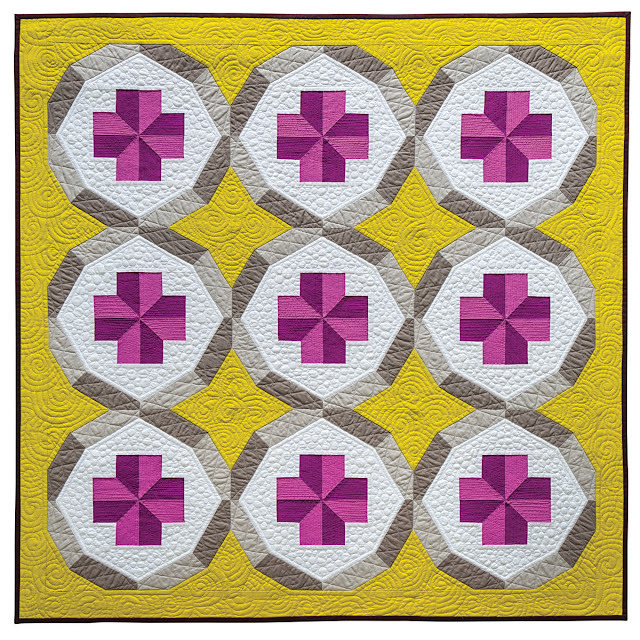 I pieced the blocks together and Johellen George quilted the quilt with a beautiful floral quilting design. Michael Miller provided the Cotton Couture Solids and other fabric to make this quilt and Warm & White batting from the Warm Company was used. Tribal Plus is a fun, lap sized design that Paige designed, pieced, and quilted. 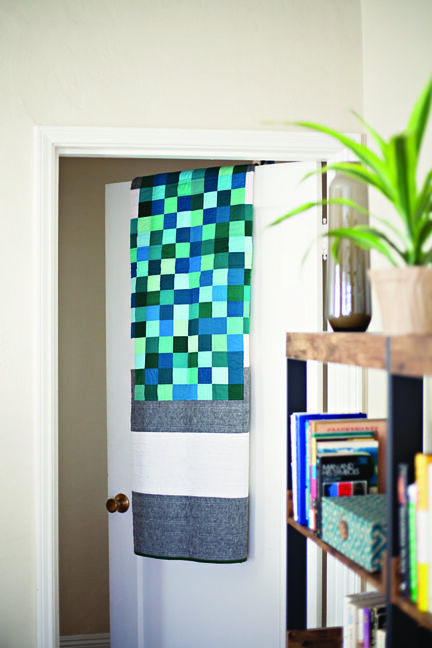 The instructions use strip piecing so this quilt comes together really quickly and easily. I love how she used quilting to highlight the row nature of the quilt. The fabrics came from Windam Fabrics, the batting was Warm & White, and Aurifil threads were used for the piecing and quilting. 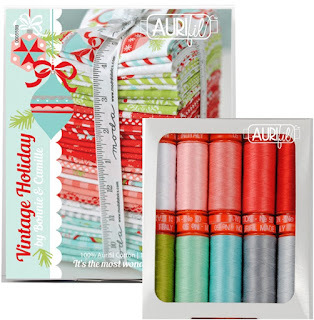 Today's giveaway is for an Aurifil 10 SMALL SPOOLS (50 wt) collection of VINTAGE HOLIDAY by Camille Roskelley, graciously donated by Aurifil (the thread will be shipped directly to the winner from Aurifil and collection may be swapped for another collection if necessary). To enter, simply use the rafflecopter: (if you are reading this post via e-mail, you may need to click over to the blog for the rafflecopter box to appear below). Giveaway runs from March 13th through 8 pm EST March 20th and is open worldwide. The giveaway is now over, congrats to Tamara G.! 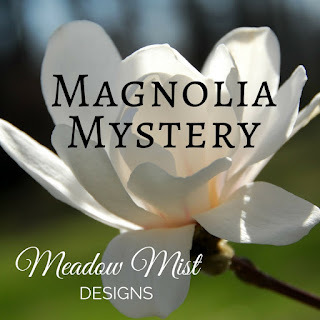 Magnolia Mystery Quilt - Winners!